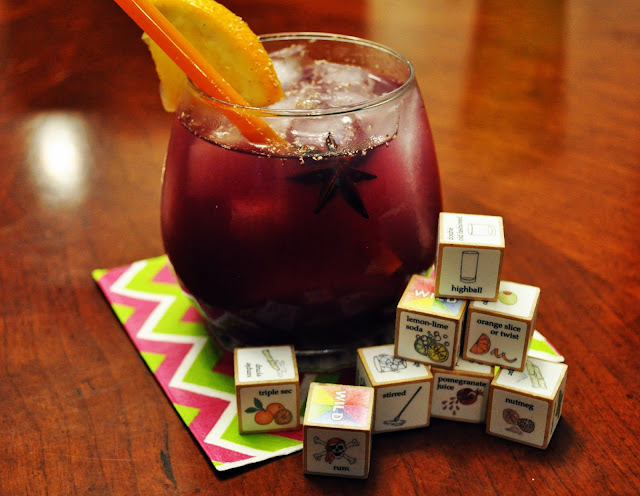 I love Leafcutter Designs Cocktail Dice. They are so versatile and fun. As soon as they arrived, I rolled and went with the first try! Don’t take it too seriously, use ingredients that you have. Mix and match as you see fit. You can create delicious libations with just one roll. When I rolled my dice, I immediately thought of all the rum punch that is flowing freely on the islands of the Caribbean. Spiced rum and fruity ingredients make for a delicious, refreshing beverage. Even though I did not have any lemon lime soda, I did not fret. I substituted pineapple juice because I had some in the pantry. So, if you are longing for the beautiful beaches of the Caribbean, make this tasty punch. The fresh nutmeg is traditional to Caribbean rum punch and the pomegranate juice adds a little twist. Just roll with it! In a small pitcher or 2-cup measuring cup, stir together rums, triple sec, and juices. Fill 2 highball glasses with ice and pour. Garnish each glass with freshly grated nutmeg, orange slice and star anise. Add a straw and enjoy.